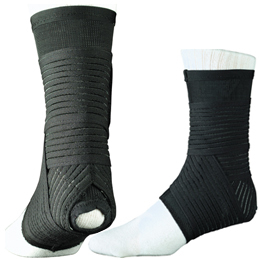 Stromgren Heel Lock ankle brace by Anatech is designed to prevent ankle injuries and ankle sprains. Features heel lock straps to control eversion and inversion of the ankle complex. Fits in any type of shoe. Circumference of the ankle bone is to be measured to determine the size. Its low profile design makes it easy to wear. Also has moisturizing capabilities to keep your foot dry and fresh during the wear. Fits Left and Right foot. Available in many different sizes; Small, Medium, Large and X-Large. For selecting the perfect fit, check our Sizes in the Size Drop Down menu. It eliminates bulk, and reduces tape use and training room time. The double strap offers compression to medial/lateral sides of the ankle. The soft segmented plushback Velcro strap gives uniform compression and tension and allows breathability. Completely washable. For use on sound ankle or on a previous injury. Wear over a sock. Fits left and right.